“A Ghost Story”: A recently deceased man (Casey Affleck) returns to his home as a white-sheeted ghost to try to reconnect with his bereft wife (Rooney Mara). 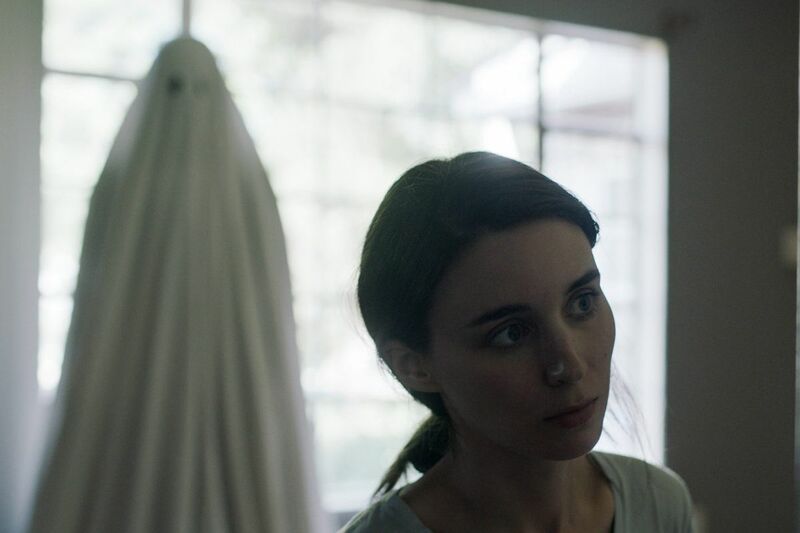 In A Ghost Story, Rooney Mara eats a whole pie in one long take, and Casey Affleck spends most of the movie under a sheet. The subject of the movie is the meaning of life. Well, the movie is trippy and almost willfully opaque — all I can say for sure is I left A Ghost Story feeling full. Certainly the movie has nerve — in an age of grandiose special effects, director David Lowery endeavors to haunt us for an hour with a ghost that is literally a sheet with two holes cut out for eyes, the most frightening Halloween costume of 1957. Underneath it, we're assured, is Affleck, playing a husband who dies in a car wreck. His 200-thread-count ghost returns to his ranch-style house to stoically peer at his wife (she cries, walks forlornly among the spare household relics, and eats the pie as though it were a missing Kübler-Ross grieving link: anger, denial, bargaining, baked goods, acceptance). Just before he died, they argued. She wanted to move, he wanted to stay, and his ghost conveys the residue of this inertia. Time passes. She leaves. Other families move in, then move out. The ghost sees them, but they can't see him, and it makes for some interesting visuals — sometimes effectively moody and stark, sometimes droll, as when one lingering ghost sees another, and a subtitled conversation occurs. This bit is strangely funny and illuminating. It shows that the ghosts are now detached from persona, from consciousness, from identity. Affleck's all-cotton character is the vestige of regret. His perturbed spirit remains dumbly attached to his former home, agitated by interlopers, and causes the lights to blink or dishes to shatter in a rage born of confusion. The ghost begins to see across vast expanses of time — in the director's most ambitious sequence, we see all that came before the house was built, and what transpires after it is gone. Against the relentless march of the centuries, what difference does one life make? That's the question posed, in one scene, by a mansplaining pessimist hipster (Will Oldham), who thinks he's smart, though his clothes say otherwise — he's wearing a denim outfit that looks like something Junior Samples might have worn at age 5. Still, Lowery answers the cosmic query in a hopeful way, so I didn't feel bad that I'd spent the last two and a half hours watching his movie. Wait, it was only 87 minutes? Well, Lowery (Ain't them Bodies Saints) is a big Terrence Malick buff, so the static shots and the long takes and spiritual noodling exact a price. Also, Mara needs to take break from Malick movies and Malick-inspired movies and call Judd Apatow immediately. Ditto Affleck, who would do well to step back from playing men who are dead or doomed or so stricken with grief that they have stopped living. This seems like a strange thing to say about a guy who's just won a Best Actor Oscar, but when you think of Affleck as cinema's reigning minimalist, it's kind of true. In A Ghost Story, Affleck gives the same performance he would have given without the sheet. Directed by David Lowery. With Rooney Mara, Casey Affleck, and Will Oldham. Distributed by A24. Parent's guide: R (disturbing image).